Founded in 1986, Art-Reach increases access to the arts for traditionally underserved audiences, including people with disabilities, at-risk youth, the economically disadvantaged, and the elderly in need. Art-Reach partners with over 125 arts and cultural organizations and 150 human service agencies throughout the Delaware Valley. Through Art-Reach’s unique programs, people of all ages, economic backgrounds, and physical capabilities can enjoy cultural events and benefit from the richness of the arts. It is the only organization in the region solely devoted to increasing cultural participation among all underserved audiences. In addition, Art-Reach serves as a public resource and advocate for cultural accessibility while also helping cultural organizations to increase their outreach to underserved communities, fill empty seats, and diversify audiences. Art Beyond Sight (ABS) is an organization dedicated to using art and culture to promote the engagement of people with visual impairments and other disabilities in their community and the global society. The organization’s network comprises individuals with and without disabilities who represent various disciplines and come from different personal backgrounds; yet all share a common interest in using art and culture to contribute to an inclusive society. The Institute on Disabilities at Temple University, established in 1974, is one of the sixty-seven University Centers for Excellence in Developmental Disabilities Education, Research and Service funded by the Administration on Developmental Disabilities of the US Department of Health and Human Services. The Institute has mirrored the changes in the field of developmental disabilities, evolving into a model for self-determination and individualized supports in the community. A vibrant, diverse organization with more than 40 staff members, including students, the Institute is considered a national leader in leadership development, assistive technology, Disability Studies, justice for people with disabilities, policy analysis and inclusive education. Kristin A. Lindgren teaches courses in literature, writing, deaf studies, and disability studies at Haverford College in Haverford, Pennsylvania. She is also the director of Haverford’s writing center. Her recent work appears in Gendering Disability (Rutgers University Press, 2004), Disability/Teaching/Writing: A Critical Sourcebook (Bedford/St. Martin’s Press, 2007), and Illness in the Academy (Purdue University Press, 2007). She was also a key consultant for Haverford’s John B. Hurford ’60 Center for the Arts and Humanities exhibition What Can A Body Do?, which combined the visual arts, poetry and scholarship. The John B. Hurford ’60 Center for the Arts and Humanities (HCAH) supports the intellectual and artistic ambitions of faculty, students and staff. The Center fosters collaboration, experimentation, and critical thought through seminars, symposia, research and curricular support, working and reading groups, arts and performance residencies, exhibitions and visual culture programming. Their initiatives reach beyond the local and familiar to connect with diverse communities of writers, artists, performers, thinkers, activists, and innovators. Pamela Dalton conducts her research at the Monell Chemical Senses Center. She has published extensively on the human emotional and perceptual response to odor and given numerous talks and presentations at scientific conferences. Dalton has been a consultant to many groups in the chemical, food, household products, and fragrance industries, as well as government and community organizations involved in odor issues. 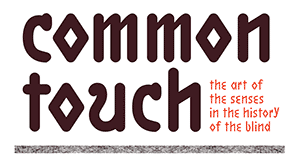 Dalton serves as advisor on the Common Touch olfactometer with scents generously provided by the Demeter Fragrance Library, Inc. The Monell Chemical Senses Center is the world’s only independent, non-profit scientific institute dedicated to interdisciplinary basic research on the senses of taste and smell. The institute’s mission is to advance scientific understanding of the mechanisms and functions of the chemical senses to benefit human health and well-being. The New York Institute for Special Education (NYISE) is a nonsectarian educational facility which provides quality programs for children who are blind or visually disabled and emotionally and learning disabled and preschoolers who are developmentally delayed. The mission of the New York Institute for Special Education is to provide quality educational programs and support to students and families in a safe, caring environment and to awaken and inspire student curiosity, lifelong learning, and fulfillment. The school was founded in 1831 as the New York Institution for the Blind as one of the first schools in the United States to provide an educational program for children who were blind or visually impaired. The Institute is also home to the NYISE Museum and Archives, which provides access to an extensive collection of artifacts, graphics, and books related to the history of the education of the blind. Philly Touch Tours is an organization with the philosophy, “Nothing About Us Without Us,” at its heart. Founded in 2015 by Trish Maunder and Austin Seraphin, Philly Touch Tours’s mission is to provide equal opportunities in cultural settings for people with vision loss. To achieve this mission, the organization provides accessibility consulting, sensitivity training and instructional workshops for cultural and educational institutions and inclusive, sensory tours and experiences for people with vision loss in and around the Philadelphia area.